Android is doing to Mobile Phones what Facebook has done to people's online presence. Android is not only getting better day by day, but handsets powered by Android OS are becoming cheaper and thus more affordable. Now when you are tempted to get a new, more powerful Android handset, you are puzzled over your old Android handset. Of course, there is eBay but wouldn't it have been great if an Android only eBay would have existed? Well, this is exactly what Swappa.com is all about! 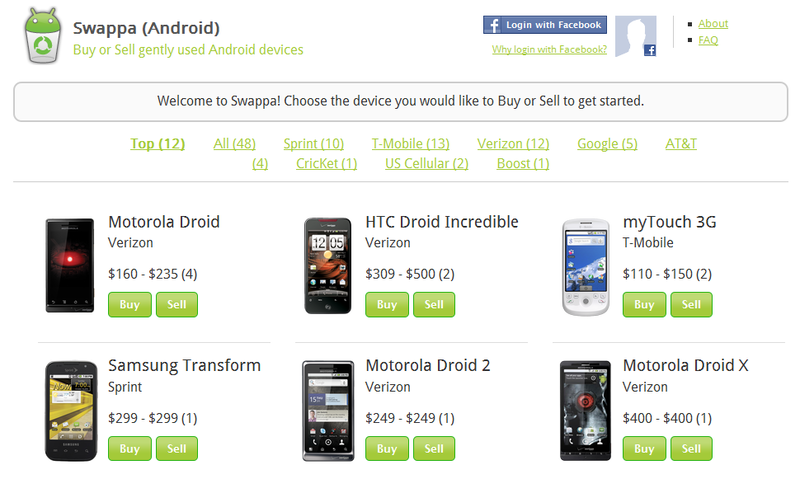 Registering with Swappa is easy via the Facebook Connect (they have their in house registration system too) The home page lists all available Android phones according to their carriers such as Sprint, T-Mobile, Verizon and others. Using Swappa, you can get any recently released Android device without having to extend your carrier contract and at a cheap price as these devices are semi-used. If you are someone who likes to change handsets often, then Swappa lets you get money for your last Android device by letting you sell it. The devices listed on Swappa are fully functional and have clean ESN/MEIDs on them which means these device have not been reported lost or stolen. The listed devices are free of water damage and screen cracks and include include shipping costs and other fees. We feel, Swappa has hit on a right spot and the right time given the Android boom which is yet to get bigger, Swappa may become the eBay for Android phones in true sense, but only time will tell!